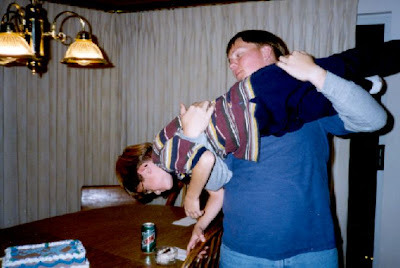 That’s my nephew flying Matthew in for the first bite of his birthday cake! Inspiration: Where Do You Find It? What a great shot! Made me giggle/smile. My photo is up too. Please stop by my blog and have a look!! I will exercise for comments!! Those look like some definitely wild kids! Looks like a great way to eat cake, too! How wonderful! Ya know, I’m the kinda gal that would just LOVE this. My wild in the desert is posted. Come join in….but keep the bread crumbs in your pocket!!! Thanks for your submission to Bestest Blog’s Meme Carnival! I have enjoyed reading all the great memes out there in the blogosphere. If you have a chance, can you post about the carnival either Sunday evening or on Monday, and include a link? And where would the picture be of the birthday boy’s face… after the first bite of cake? Oh dear, what happened to the cake; or perhaps to Matthews face? Thanks for coming by my place and encouraging me. Very cute! Would’ve loved to have seen that first bite too! !